Illustration from a poster by Susanne Yelin, Elena Kuznetsova, and Robin Côté. (PhysOrg.com) -- The new system, which can compute faster and more efficiently than previous quantum computers, may bring the technology closer to reality. Quantum processors take advantage of the principles of quantum mechanics, in which objects behave differently at very small scales than matter does at larger scales. Usually, their processors encode information into either individual atoms or molecules made up of two atoms. But Kuznetsova and her research group have proposed the first viable system that uses both atoms and molecules, taking advantage of the benefits of each. This system could be capable of computing faster and more efficiently than previous quantum processors. Kuznetsova and her colleagues in physics, including graduate student Marko Gacesca and professors Susanne Yelin and Robin Côté, report their results in the March 2010 issue of Physical Review A. As Yelin explains, there are several components to quantum computing. The first challenge is to create a system that you can control well enough to perform your computing, and another is to fashion a device that will report the results without damaging the system. The most advanced quantum computing to date is performed by neutral atoms, which, says Yelin, physicists have spent decades mastering and can now control to a very fine degree. These neutral atoms have no electric charge, and are therefore very difficult to get to interact with one another. This difficulty slows down the rate of computations. 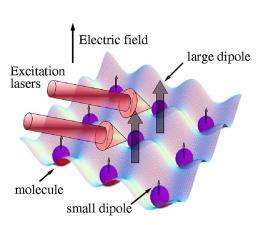 In recent years, however, scientists discovered that polar molecules — which contain two atoms with equal and opposite charges — could lead to faster processing in quantum systems because the presence of these contrasting charges encourages the molecules to interact strongly with one other. But this difference in molecular behavior is at once a great solution and a big problem, says Yelin. To be useful, these hyperactive molecules need to be cooled to only a few millionths of a degree above absolute zero, which slows them down and allows scientists to control them. The fragility of these molecules also poses another problem: when they’re used to report results from a quantum processor, scientists often lose control of them and the very data they’ve been trying to compute is destroyed. Until now, researchers hadn’t come up with a good way to read data out of these molecules. 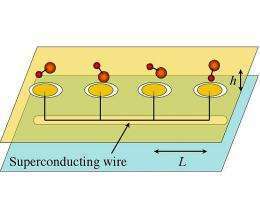 In their recent paper, Kuznetsova’s group devised a way to separate the molecules into their component parts so that the processor’s results can be read from the more easily controllable individual atoms. By using lasers, says Kuznetsova, they were able to break down the molecules without compromising the data encoded in them. Kuznetsova says that each portion of their concept is practically feasible using current experimental methods, but only for a generalized ensemble of qubits — as units of quantum information are known — all at once. The next step toward building a computer with polar molecules, says Yelin, is to create a system in which the qubits can be controlled individually. Yelin admits that her work can sometimes seem supernatural to non-specialists, but she says she wouldn’t have it any other way.